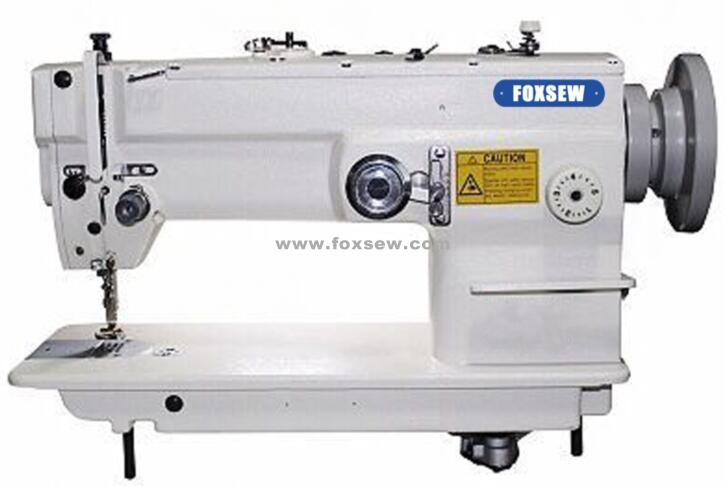 FOXSEW Flat Bed Large Hook Zigzag Sewing Machine with Automatic Oil Lubrication. This machine is with new mechanism of penduous needle with fast sewing speed up to 2800RPM motor, 50MM pulley, 1.5 times higher efficiency than normal Zigzag Sewing Machines, Fully automatic lubrication assures less friction on machine parts; which increases the life of the machine, and lowers the fee for repairing. The lower shaft transfers the movement to the axle of the rotary shuttle. Double bigger size of a large bobbin reduces the frequency of changing the bobbin thread; and which also rises up sewing efficiency. This machine is suitable for sewing thin,medium,and thick fabrics of garments such as brassiere,underwear,gloves,shoes and caps,leather articles,bag etc... The machine can make beautiful and high-quality stitches,and it is an important product in relative industry. The machine adopts forward and backward feeding mechanism,and it has advantages in running smoothly and operating easily. Looking for ideal Large Hook Zigzag Machine Manufacturer & supplier ? We have a wide selection at great prices to help you get creative. All the Large Hook Zigzag are quality guaranteed. We are China Origin Factory of Automatic Oil Lubrication. If you have any question, please feel free to contact us.